Compucon's storage solution platform is versatile and cost effective - a building block for every storage requirement. From a stable, standardized platform the solution is customised to suit your particular needs; whether it is scalability for an ever-expanding collection of files or databases, performance for real-time video streaming or rack density to save data centre costs, the Compucon storage solutions are built to be an exact fit for the purpose. 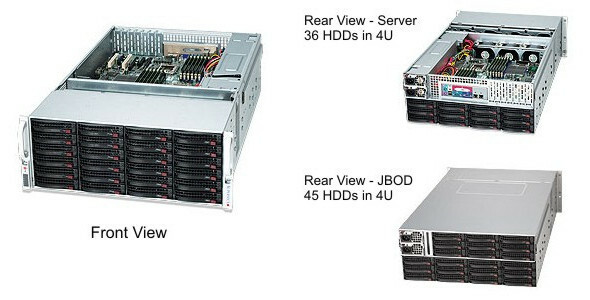 Add a new stand-alone storage server to a network. Add centralised storage to multiple (existing) servers on a network. Attach additional disks to an existing server. Compucon Storage Servers can come in a wide range of chassis options, from 1U to 5U, with and without redundant power supplies and front hot-swappable drive bays. Our largest 4U chassis can fit up to 36 hard disk drives (server) or up to 45 hard drives (disk-only expansion chassis). The latest generation of Compucon Storage Servers also introduce a new way of providing optimal, structured storage called Tiering. For more information please see our September 2014 Newsletter here.